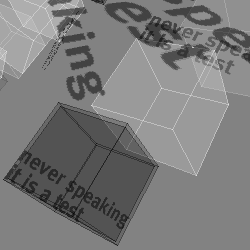 Developed in Processing, [theHouse] is a good example of a piece that works well with granular texts in a 3D environment. The piece presents an imaginary architecture, made of blocks in a virtual space with changing texts attached to them. The texts are about a relationship between two people coming apart in a confined space. The objects react visually to the reader's struggle with the text, representing simply and meaningfully the human struggle described in the text itself. Author description: [theHouse] is a digital poetry piece which takes the form of computer-based spatialized organism.world. Through the process of enacting texts within, alongside, and outside of the text of computational code, this autobiographical work is regulated by the computational process of the sine wave. Here, the text is written upon "rooms," and these rooms emerge to create "houses" next to and among the intermingling text. As in much of electronic literature, the experience of the work as an intimate, interactive, screen-based piece is essential to understanding and appreciating it. Indeed, the work is only realized through user interaction and navigation. How does everyday spatial practice bring into focus the relationship between code, language, and relationships? What are the key characteristics of digital relationships as seen through this light? Does the recurring emphasis on process, chance, and interactivity also function as an indicator of larger questions about the chance writing of the text? The poem presented is autobiographical in nature yet engages the conceptualization of both language and embodiment as the text creates its own types of organism. Instructions: To navigate and change the texts that are shown, click and drag. Previous publication: [theHouse] was published on Flanagan's site, http://maryflanagan.com, in 2006.